Some scouts expressed concerns prior to the 2014 Draft as to why Sam Coonrod had not generated the type of success his abilities seemed to warrant. No one doubted his arm strength and his arm speed, which generated fastballs that were clocked as high as 98 mph. Yet his results in three seasons at Southern Illinois were not overwhelming. Coonrod's numbers with the Salukis included a modest 8-17 record with a 3.86 ERA, 199 strikeouts and 116 walks in 228 1/3 innings. Suffice it to say those concerns can now be put to rest. Drafted in the fifth round by the San Francisco Giants in 2014, the right-hander went 1-0 with a 3.90 ERA in 15 appearances, including five starts, in the Arizona League last summer. This year Coonrod has been one of the best starting pitchers in the Minors after honing his craft during instructional league and Spring Training with the Giants' pitching coaches. "I've learned a whole lot from all of the pitching guys in the organization, the guys in the front office, the rovers and my pitching coaches [Larry McCall, Mario Rodriguez and Jerry Cram] that I've had in Rookie ball and here in Augusta," Coonrod said. "They definitely know what they're doing, and that's a big reason for the success I've had this season." 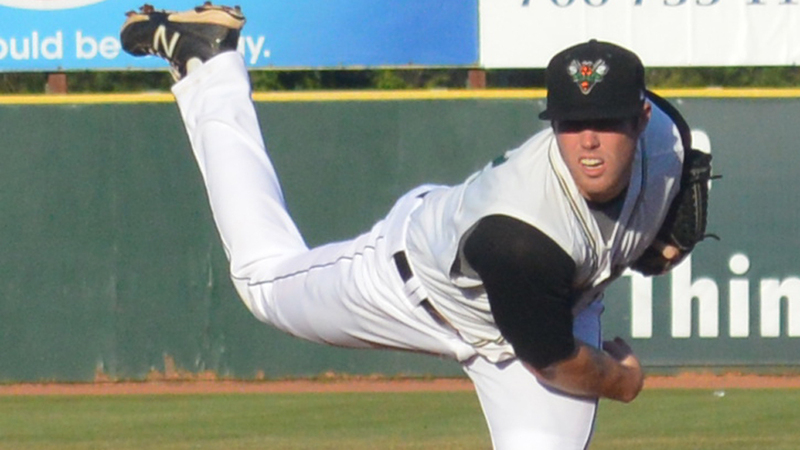 Through his first 16 starts with the GreenJackets, Coonrod led the South Atlantic League with 89 strikeouts and topped all starting pitchers on the circuit with an average of 9.1 whiffs per nine innings. He also ranked fourth in the SAL with a 2.45 ERA, placed fourth with a .229 opponents' batting average and 10.9 baserunners per nine innings among starters, and was fifth with a 1.13 WHIP. His best performance came July 20 when he limited Hickory to one unearned run and three hits over eight innings, which marked the longest outing of his professional career. Coonrod retired the first 14 batters he faced and recorded 12 groundball outs. He did such a good job keeping his pitches down in the strike zone that only three balls were hit into the outfield until the Crawdads scored their lone run in the eighth. "I thought that was one of my better games," Coonrod said. "The defense behind me was really good and my catcher, Aramis Garcia, called a really good game. I threw strikes well at the start of the game and I stayed down for the most part except at the end a little bit. Everything was working that day." Coonrod went eight innings once at Southern Illinois, when he helped guide the Salukis to a 2-1 victory over Indiana State on April 11, 2014. A former three-sport star at Carrollton High School in Indiana, Coonrod made gradual improvements throughout his three years in college. Even so, he had only a 2-6 record despite a 2.87 ERA as the team's Friday night starter during his junior campaign, which left some observers scratching their heads. "I definitely enjoyed my time at Southern Illinois and learned a lot about how to play the game the right way," Coonrod said. "I've been a work in progress since high school. I was wild and never really knew how to pitch when I got to college. I mainly just threw the ball." Coonrod still works off his plus fastball that sits in the 92-93 mph range and mixes the heater with a hard slider in the upper 80s and a changeup. He admits he had trouble throwing both of his secondary pitches with consistency prior to signing with the Giants but has made significant strides in his ability to pound the strike zone with all three offerings. "My secondary pitches are tighter and I have better overall command," Coonrod said. "I've definitely learned quite a bit, and I feel like I'm making the progress I need to make so I can go out and give my team a chance to win every day. The key for me now is to continue being more consistent in my ability to throw strikes." Lowry on the leader board: Kannapolis right-hander Thad Lowry won his 10th game when he allowed only two earned runs over seven innings in a 3-2 victory over Hagerstown on July 20. Lowry became the first Intimidators pitcher to reach double digits in wins since 2011 and joined West Virginia's Austin Coley and Hickory's Ariel Jurado for the SAL lead in the category. Lowry has 13 quality starts in 17 outings this season. Change of scenery: A move to the bullpen has led to impressive early returns for West Virginia pitcher Dovydas Neverauskas. The Lithuanian right-hander opened 2015 in the Power rotation and posted a 1-2 record with a 7.85 ERA in five outings, including 15 walks in 18 1/3 innings. Since shifting to a relief role in May, Neverauskas has a 1.50 ERA in 10 appearances with only two walks in 24 frames. In his last five outings, he has allowed no earned runs, six hits and no walks with five strikeouts in a combined nine innings. Tough times for Twine: The Marlins knew shortstop Justin Twine was raw and needed work on his pitch recognition and strike zone judgment when they drafted the shortstop with the 43rd overall pick in 2014. A three-sport star in high school, Twine did not draw a walk this season until his 35th game and 137th plate appearance, May 28. He did, however, get on base via a walk in three straight games, from July 14-16, to give him six walks on the campaign versus 76 strikeouts. Overall, Twine is hitting .183 with a .221 on-base percentage.